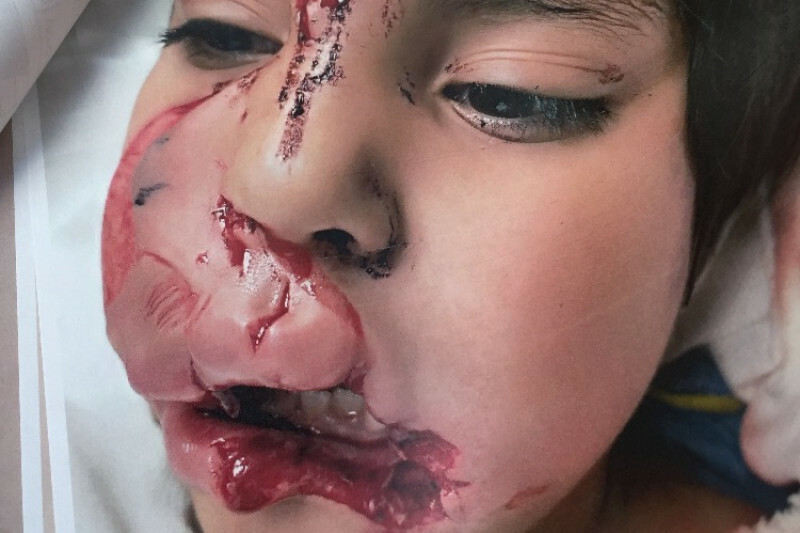 Dogs Bite Decatur Al: SAN ANGELO TX - A PIT BULL "SERVICE DOG" ATTACKED 7-YEAR-OLD ISRAEL IN THE FACE AS HE REACHED DOWN TO PET IT ....PIT BULL DRAMA OVERLOAD!!! 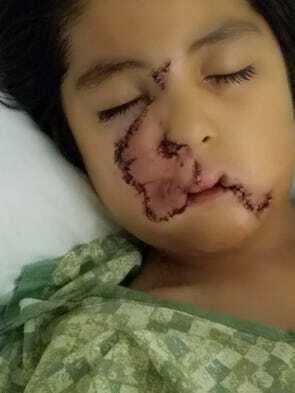 SAN ANGELO TX - A PIT BULL "SERVICE DOG" ATTACKED 7-YEAR-OLD ISRAEL IN THE FACE AS HE REACHED DOWN TO PET IT ....PIT BULL DRAMA OVERLOAD!!! 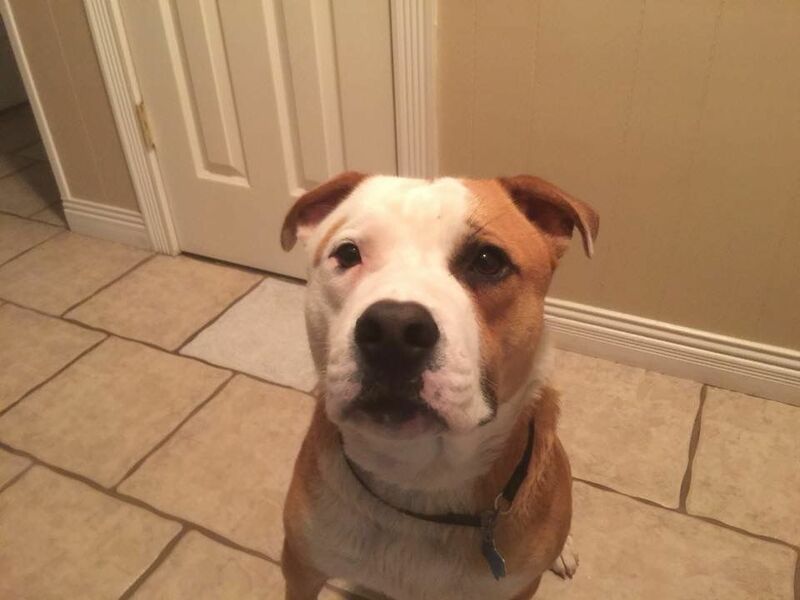 SAN ANGELO — Seven-year-old Israel Costilla stood beside his mother and grandmother as a judge ordered a pit bull named Trouble to be euthanized.The verdict was a sad sigh of relief for the Costilla family. On Dec. 9, the dog mauled Israel Costilla after the boy entered a home shared by his great aunt, Lisa Peden, and her then-roommate, Rayetta Trigg — the pit bull’s owner. Trigg, who was in New Mexico visiting her father, did not witness the attack. At the hearing Thursday, Peden said she pulled the dog off Israel and dragged it outside. Then she and Israel’s mother, Andi Costilla, frantically called 911. Officer Green of the San Angelo Police Department saw Israel lying on a stretcher when he arrived. “It looked like part of the child’s face had been chewed off completely,” Green told the court. After calling Animal Control Services, Green entered the residence and made a second gruesome discovery: “I saw what looked like part of a child’s face in a pool of blood.”Green checked on the pit bull outside, testifying in court that he kept one hand on his gun for safety, afraid the pit bull might attack again. “He wears a mask out in public,” Ana said. “You know, he doesn’t even like seeing himself in the mirror, so every time he goes to take a shower, we have to take the mirror down in the bathroom. The state prosecutor argued the pit bull is dangerous and should be released to Animal Control. After private deliberation, Gilbert returned to the courtroom and delivered his verdict. “These decisions are always difficult because there’s a lot of emotions on both sides,” Gilbert said. He then pronounced that Trigg was harboring an animal “declared to be a nuisance,” in line with Chapter 3 of the city’s animal control ordinance, which states If the court determines an animal is “vicious or dangerous” or “has bitten or attacked any person,” the court may order the dog be delivered to the animal services director and be destroyed. Gilbert then ruled the pit bull would be taken from its owner and given to animal services. Trigg was fined and further ordered to pay restitution to the Costilla family for Israel’s medical expenses.Outside the courtroom, the Costilla family appeared relieved but solemn. On the other side of the closed doors, Trigg could be heard sobbing loudly.“It’s a sad day all around,” said Israel’s mother. A gofundme.com page has been set up to help with Israel's medical expenses at https://www.gofundme.com/current-and-future-medical-expense. On December 9th in San Angelo, Texas there was a vicious dog attack. The owner of the dog Rayetta Trigg left town for a week and left her "Service Dog" with her roommate. The dog has had no "Official Service Dog Training" only a doctors letter she requested around 6 months ago so she would not have to pay the pet deposit at her apartment before she moved into her trailer where she lives now. To date the dog is 1 1/2 years old and still has never had any official training. The dog did have all of its shots and tags because when she moved in with us we forced her to do it for the safety of our own animals and so it would also be legal. She left for her trip to see her dad and the roommate had no idea what her dog was capable of. The roommate invited her neice over to visit and when she did she brought her two small children. The Aunt along with the Mother and the two children walked into the house. As they walked to the living room the 7 year old boy Israel started petting the PIT BULL named TROUBLE on the head. The Aunt and Mother witnessed the dog attack Israel in the face for no apparent reason. They ran to Israel's defense and pulled TROUBLE away from the child but it was too late. 911 was called and the child was carried by ambulance to Shannon Hospital. I wrote the entire story on my Facebook page because it has yet to make news in San Angelo, Texas. Rayetta Trigg the owner of the dog refuses to turn the dog back over to Animal Control to be put to sleep because it is not "IF" the dog will bite again it is "WHEN" the dog will bite again. The dog did stay 11 days in the Animal Control Facility but it caught Kennel Cough, lost approximately 25 pounds and was throwing up. Rayetta said they called her to pick him up a day early because he was so sick. The people at the Animal Control were all new and had not dealt with a vicious dog attack of this nature yet. There was one woman there that said it was the worst attack that she had ever seen in San Angelo since she had been there. I personally spoke to Rayetta for 2 days and she never showed compassion towards the innocent child Israel. All she talked about was her dog and how it was mistreated. She has come up with every excuse under the sun and even blamed the child for abusing her dog when that never happened. Rayetta even downplayed Israels injuries until I asked her to show me the picture she had on her I-phone because she would not offer to show me on her own. When she let me see the picture I literally almost fell off of my stool. I showed the picture to my husband and friend Adam and they were shocked as well because she downplayed the entire situation. I posted all of this on my Facebook Page and thus far the responses have been overwhelming. There have been literally hundreds of responses saying she should have the dog put down so it never happens to another individual and she absolutely refuses. Only 2 people have defended her on her page because she lied to them and they believe her even though she was not even present. Rayetta still lets the dog out in her yard without her to use the restroom and the fence is delapidated with no locks on the gates. The Pit Bull "TROUBLE" could easily escape and anyone could have access to the unlocked backyard. I fear for the safety of the neighborhood and I am doing everything in my power to make the story public and also get funding for the child's medical Bills now and in the future. Last year my husband and I got a call from Rayetta and asked for our help. When I found out she had a Pit Bull I almost refused and she assured me she would be responsible at all times. It was then that I found out he had never been vaccinated and I requested it immediately. Years ago I was a Police Officer and I also went to Animal Control School and became Certified. I watched the dog carefully and many times I talked to Rayetta about her dog TROUBLE. I personally witnessed Trouble when he became smitten with my Border Collie named Melania. At that point he would not let her Brother Border Collie named Trump go anywhere near his sister or he would growl at him. I also witnessed TROUBLE go after a dog at the new Dog Park and the two dogs had to be seperated with the enclosed fence. If TROUBLE wanted something he pulled Rayetta with him by the dog leash and she could not control him. I told her to go purchase a muzzle and also a special dog leash but he broke it the same week and she never bought another one nor did she purchase a muzzle as I requested her to do for the safety of everyone. My husband and I BOTH warned her many times that he could not be trusted and to never let him around children but she would just look at us and tell us "I know my dog TROUBLE would never bite anyone!" When Rayetta moved in with us she told me personally that TROUBLE had just been in a huge fight with another Pit Bull and 3 men to include herself could not stop the fight. I was at the Vet with her and she came out laughing and told me that when the Vet stuck his finger in the backside of TROUBLE he started growling and almost bit the Vet. When she lived in a small camper trailer with the dog if she heard a noise she would tell TROUBLE "Listen TROUBLE, who is it? Get 'em TROUBLE, Watch'em" and the dog would immediately get excited. She also admitted if she got upset the dog would immediately do the same and she knew if anyone messed with her TROUBLE would attack them. Well, unfortunately it did happen and not only was she gone but nobody caused harm to TROUBLE in order for him to go on attack. Israel will face a lifetime of challenges now and thus far has had to have 2 surgeries with many more to come in the future. I will post all the pictures we have thus far and I will continue to update everyone on Israel's progress. Israel will not go outside unless he is wearing a mask because he says he is "UGLY" now. The mental and physical damages he will have to face are surmountable but with GOD and LOADS of LOVE I know he can survive this attack and GOD will use him for HIS GLORY! I set up this GoFundMe page to help with the Medical Bills, Counceling and I would like to purchase toys so he can be showered with LOVE!!!!! I will make sure all DONATONS go directly to HIS WELLBEING and help the parents with any extra costs they may have due to this trajic event. I will keep a log of all funds and how they were dispersed on this page as well so EVERYONE knows where, when and why it was used. If anything is left over it will be donated to an Animal Rescue Facility! I know it is right after Christmas and people's budgets are tight but I beg of you to donate even $1.00 to help Isreal and bring some joy to his life. My gut hurts right now and I will be testifying in court this next Thursday if the Judge wants to here from me. Currently the Aunt just told me he is now terrified of big dogs and he does not like being in public at all due to his scars. An appointment has already been set up for counceling as well. Once we go to court this next Thursday I will update this page immediately. Myself, Israel, his Aunt, Mother and Grandmother want to thank everyone in advance for your prayers and your generosity. GOD BLESS you and PLEASE make this go VIRAL because it just might save another child from having to go through this horrific event. These kinds of attacks are partially the ADA's fault because of their stupid intentionally unenforceable 'requirements', or lack thereof. They've set innocent people up at targets for lying, conniving dangerous dog owners and their poor choices in 'service animals'. How tragic for this poor child. The dog should be euthanized unless the owner can provide secure confinement at all times as well as carry at least $1,000,000 liability insurance. If I were the insurance company, I wouldn't cover this dog. No doubt, this dog is extremely dangerous. The landlord can be sued for allowing this dog on the property. I am personally against pitbulls for service dogs. This dog is not a service dog. I hope the court orders the dog euthanized. I hope the dog does the same to his ignorant, selfish, lying POS owner. Shannon, make sure you donate to rescues who don't support pitbulls or other fighting breeds. Is there such a rescue? Federal law prevents states from enacting laws against service dogs, as such laws could prevent legitimate service dogs from traveling from State to state. In addition, some legitimate service dogs are owner trained. Buying a trained service dog is quite expensive. Besides, there is no law that defines what a service dog does due to varying disabilities. Just because someone says he/she trains and certifies service dogs does not mean the alleged trainer is a good trainer. There is a lot of room for dishonest trainers. Overhauling the system is not so easy when one consider all the ramifications. A friend takes home trained service dogs with her all the time, and hers are well-trained. I sometimes take a dog with me, and the same is true for mine. That picture was hard to look at and the story about the dogs owner made my blood boil! That owner is seriously mental, she should be committed in a secure facility. An unvaccinated service dog? How about a typical irresponsible pit bull owner that found a way to skirt around the rules in place meant to protect the public? Once the "abused" pit bull harmed a child, it should have been put to sleep asap. Enough of this nonsense of pit bulls above children. May God pls continue to Bless handsome Israel and stay with him through this the rest of his life!! The home and dog were left in the responsible trusted care of her roommate. Owner wasn’t even there and children shouldn’t have been there, especially since they seemed concerned about the dog already! !